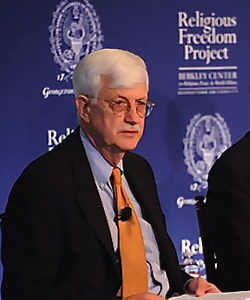 Thomas F. Farr is director of the Religious Freedom Project at the Berkley Center for Religion, Peace, and World Affairs and a visiting associate professor of religion and international affairs at Georgetown’s Edmund A. Walsh School of Foreign Service. A former American diplomat and leading authority on international religious freedom, Farr has published widely, including “Diplomacy in an Age of Faith” in Foreign Affairs (March/April 2008), and World of Faith and Freedom: Why International Religious Liberty is Vital to American National Security (Oxford University Press, 2008). Farr received his B.A. in history from Mercer University, and his Ph.D. in modern British and European history from the University of North Carolina. After a distinguished career in the US Army and the Foreign Service, Farr served as the first director of the State Department’s Office of International Religious Freedom from 1999-2003. In that capacity he traveled widely to promote religious liberty, engaging religious communities, government officials, and the victims of religious persecution. Dr. Farr’s publications include “The Bush Administration and America’s International Religious Freedom Policy,” with William L. Saunders, Jr., in Harvard Journal of Law and Public Policy; “International Religious Freedom and American National Security in the 21st Century,” in the Drake Law Review; “Bringing Religion Back into International Religious Freedom Policy,” in Jonathan Chaplin, ed., God and Global Order (Baylor University Press); “Public Diplomacy in an Age of Faith,” with Jennifer Marshall, in Philip Seib, ed., American Public Diplomacy: Reinventing U.S. Foreign Policy (Palgrave Macmillan); and “American Religious Freedom Policy,” in Alfred Stepan, Monica Toft and Timothy Samuel Shah, eds., Religion and International Affairs (Columbia University Press). Dr. Farr has testified on international religious freedom policy before the US Congress. He has made presentations on religion and foreign policy at a wide variety of government agencies, think tanks and universities, including the Department of State, the Congressional Task Force on Religious Freedom, the Library of Congress, the Pew Forum on Religion and Public Life, the Woodrow Wilson Center, the Ethics and Public Policy Center, the Heritage Foundation, the Federalist Society, Tufts, Princeton, Georgetown, Drake University Law School, Brigham Young Law School, the Catholic University of America, Wheaton College, and Mount St. Mary’s College. He recently delivered a series of lectures to American diplomats at the Foreign Service Institute. Farr is a member of the Chicago World Affairs Council Task Force on Religion and US Foreign Policy. He is vice chair of the board of Christian Solidarity Worldwide-USA and a contributing editor to The Review of Faith and International Affairs. He is the recipient of the Jan Karski Wellspring of Freedom Award, presented by the Institute on Religion and Public Policy for contributions to international religious freedom. Under Farr’s leadership, the Religion and US Foreign Policy Program has sponsored a series of major symposia with the support of the Luce/SFS program on Religion and International Relations. These included symposia on “Islam, Constitutions and Durable Democracy: The Cases of Iraq and Afghanistan” and “Religion in Israeli Society, Politics and Foreign Policy.” In 2008, during the tenth anniversary of the 1998 International Religious Freedom Act, Farr organized three symposia on various aspects of international religious freedom policy. Out of these symposia came The Future of U.S. International Religious Freedom Policy: Recommendations for the Obama Administration (co-authored with Dennis R. Hoover) and the Berkley Center’s Report on the Georgetown Symposia on US International Religious Freedom Policy.